The last makeup is bless on earth! AW MAN. I want a TARDIS cookie jar! Also you've got me kind of liking that red shadow, to which my normal reaction would be "ew, no, makes me look like I have some kind of eye cooties." I might have to test drive that stuff. Omg! 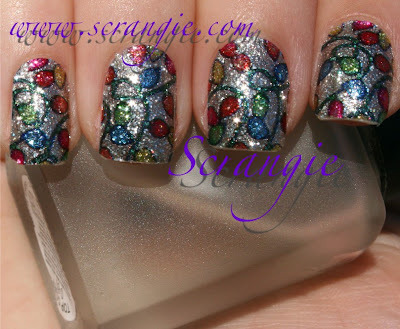 I LOVE LOVE LOVE your Incoco Nail Appliques!!! They look SO nice!!! Hope you had a super merry Christmas! xoxo. Wow,Scrangie! 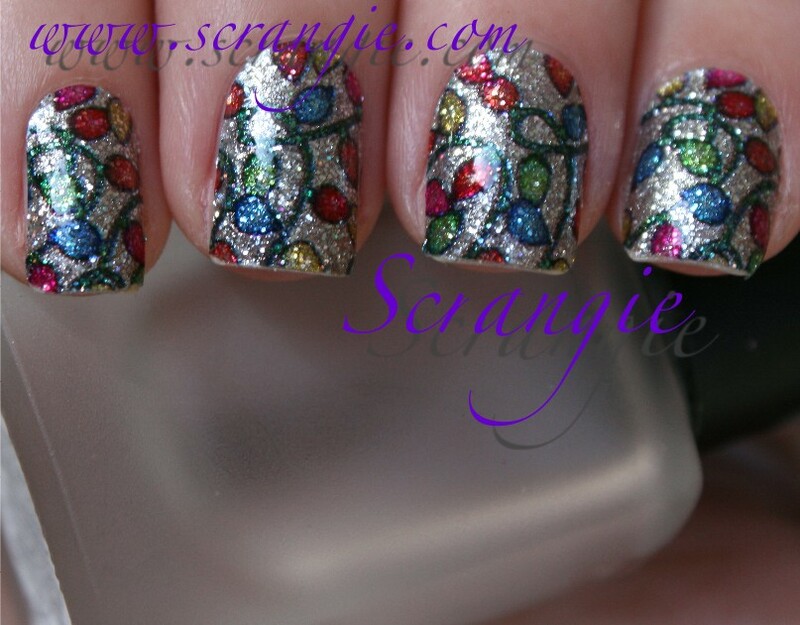 When I first looked at your nails I thought what a pretty Konad design.My second thought was it looks like stained glass. Wouldn't have guessed it is a nail applique. So pretty! The Innocco look fantastic! I really love them. I really like the nails! I hope everyone had a great Christmas! I loved your nails but today I loved your eyes better! 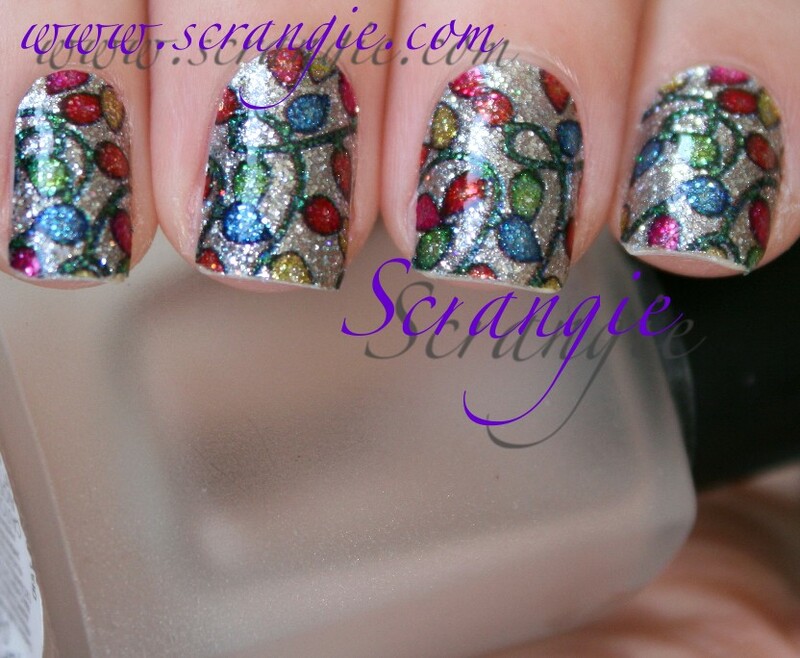 Pretty Christmas mani!! So festive. Your Christmas day eye is beee-you-tee-full. It also looks like a pretty sunrise, looking at the colors alone from the lower lid up. The incoco strips look amazing too, their designs are so cute. 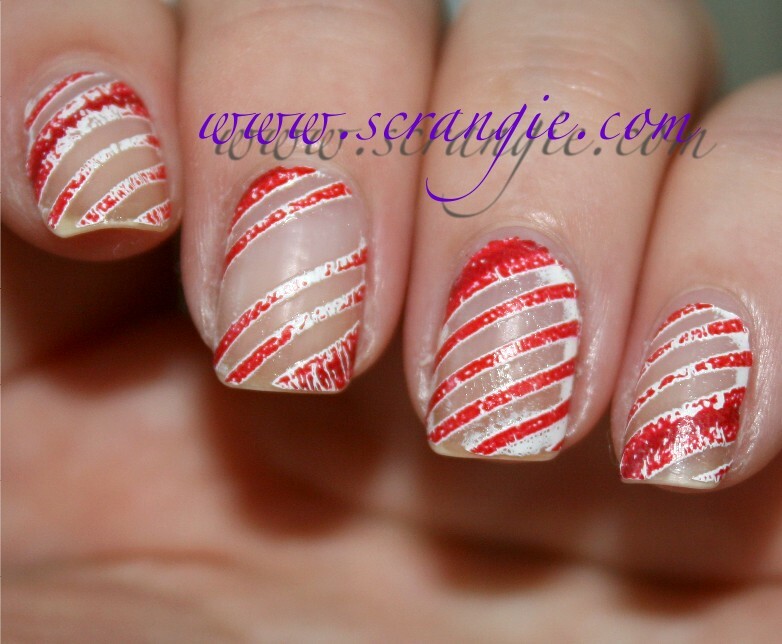 I had the wrinkling issue with the Sally Hansen strips too, I thought it might have been because I used a fast-dry top coat, and some had gotten under the strip? Your makeup is impeccable as always. The nail designs are gorgeous. Candy cane skeltons are great. Incoco always wins, but I'm LOVING the eyes! Especially that red. Just curious, when you apply shadow wet, what do you use? Commercial dry-to-wet solutions, or something else? I find myself reaching for my contact lens solution. 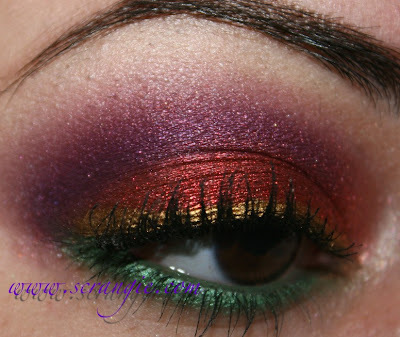 I mix few drops with crushed shadow or pigment and apply like a cream. Dries fast and really intensifies the colour. And it's something I always have on hand, so there's no extra expense. The Incoco looks really great! 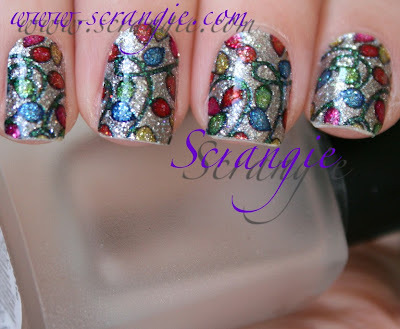 I am totally craving the snowflakes ones!! I hope you had a wonderful Christmas! Love this look! The nails are awesome! Wow! amazing eyes. I love them. Always jealous of the beautiful color combos other ladies use. Im not brave enough. 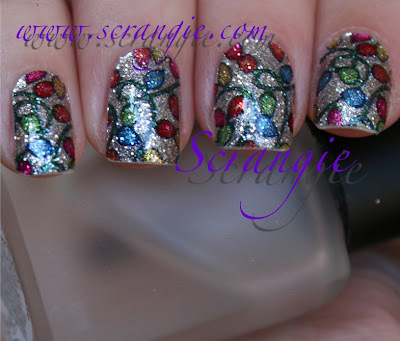 The light nails are just toooo cute! Also, super jealous over your cookie jar! I must find one. Your eye looks are simply gorgeous!!! I think I seriously need that Sugarpill Asylum in a BIG way. I agree with you about Stila's Koi liner. I bought a backup when I heard they were discontinuing it. I have found that Milani's Liquif'eye Metallic Eye Liner in Gold is a reasonable substitute. It's just a teeny-tiny tad darker, but still has that glorious gold goodness. And I love the peppermint skeletons! That effect is SO multi-dimensional and cool. I want to get them and then take them off just to get that look! You've started another trend, girl! And I'm with stream27- what do you use to wet your shadows? They always come out so nicely, and they don't look flakey at all. SCRANGIEEEE!!! That's NOT a crappy eye look at all. I gasped when I saw your Christmas Eve eye look. 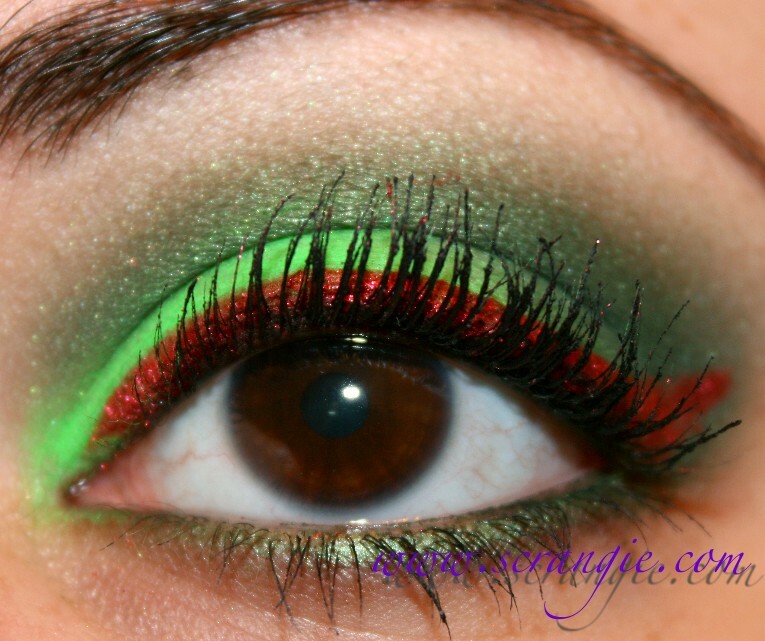 So fun - I just love how you use bold colours and aren't shy to wear vivid liners. And your Christmas eye look is beautiful! You blend like a pro. Stream27 and ReaderRita, I use a few different things, depends on what I have out on my vanity at the moment. Usually it's MAC Water-Based Mixing Medium, sometimes Visine or my contact lens solution, sometimes I use my Decleor facial mist (comes in a big spray can, smells nice)... All of those have worked great for me, but I rarely use just plain water. And ReaderRita, I have that Milani liner and I LOVE it. All of Milani's Liquif'Eye pencils are super awesome, I adore them. Thank you for the info! I've wondered about the MAC Mixing Medium- now I'll have to try it! I love those Milani liners, too- but I just got the brown "metallic" one, and they lie- it's not metallic at all! SO bummed. But I love my Gold and Aqua ones. 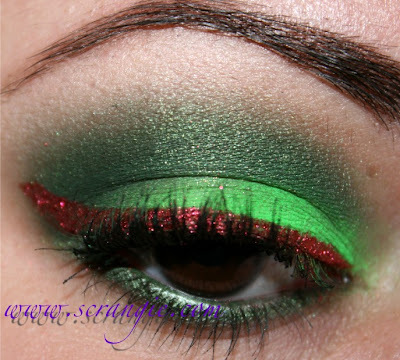 Love all the christmas looks! I won't lie though, my first thought when looking at the Christmas Day look? "Man that is an AWESOME Robin themed makeup look..."